Connect your laptop to reliable internet. We highly recommend a wired ethernet connection to avoid wifi issues. If you are unable to have a wired ethernet connection, another solution is to set up a cellphone as a mobile hotspot. In spf.io, set your session as the current one for the audience to access. In the Sessions homepage, locate the session and click the button “mark as current” next to the session title. This sets the URL /z shortcut to point to the selected session. Read more about the /z shortcut here. Determine which control and display setup you will have at your event. You can control and display the content to your audience a few different ways. 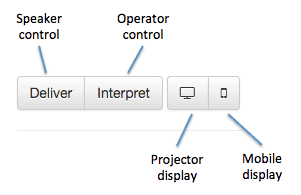 SPEAKER CONTROL: the presenter controls the display of slides and subtitles by selecting the “Deliver” option. INTERPRETER CONTROL: an A/V person or interpreter controls the display of slides, subtitles, and captioner by selecting “Interpret.” Use this if you plan to use the live captioner. PROJECTOR VIEW: set up spf.io to display on a projector screen for the audience to view by selecting the projector icon. MOBILE AUDIENCE VIEW: direct your audience to visit the session’s audience URL or QR code to get slides and subtitles on their phone. Clicking this button opens the mobile view. PROJECTOR SCREEN: If slides/subtitles will be shown on a projector screen, open the projector view on the computer connected to the projector. To open the projector view, click the Project button for that session. A new window should appear–this is the projector view. Click on the menu icon in the bottom left hand corner and set the language(s) you wish to show on screen. NOTE: in this menu, you can also change the formatting of the text and other controls. AUDIENCE MOBILE VIEW: If slides/subtitles will be accessed on audience’s mobile devices, direct them to your session’s URL or QR code. They will be able to select their language and get slides and subtitles on their own devices in real-time. Test the display(s) to ensure they function as expected. Connect the microphone input to spf.io via the soundboard with a male-to-male 3.5 mm cable. If spf.io is running on a computer that does not have a dedicated microphone jack, a USB converter* is required. In spf.io, open the Interpret view for the session. Ensure the proper channel is selected (i.e. if the speaker is speaking in English, ensure the English channel is selected). Click “Captions” in the bottom blue bar and “turn on” to enable microphone input. 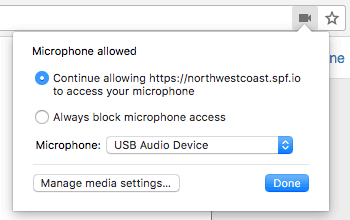 You may need to grant access to the microphone. Click the Camera icon in the URL box and select the microphone input to listen to. Enable auto-translate so the captions are automatically translated. Test to confirm microphone input is coming through to spf.io as expected. Turn off the captioner once testing is complete until the event begins. Archive the history to clear out the test slides/subtitles before the event begins.